Paging Trump: Starbucks Issues Holiday Cup - Joe.My.God. Starbucks’ years-long war on Christmas is over. The coffee giant wasted no time getting into the Christmas spirit this year, releasing its new holiday-themed cups and holiday beverages on Wednesday. Goodbye, Halloween. Forget Thanksgiving. It’s Christmas time at Starbucks. The new line of festive liquid holders celebrates the 20th anniversary of the holiday cup, and while the company has broken away from Christmas-y themed cups in the past, the 2017 cups feature a Christmas tree, doves, ornaments, presents, and holiday cards. Is that Christmas-y enough for you, President Trump? 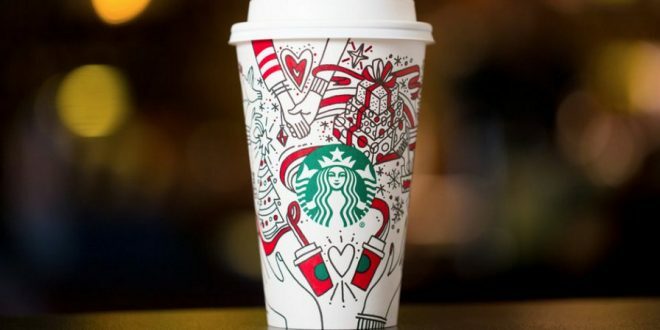 Jordan Kay, the designer, said: “I liked the idea of hands as the centering point, a symbol of connection, love and giving joy.” The cup’s sleeve — for hot beverages — features the invitation to “Give Good,” the theme for this year’s holiday cup.